Oh my, it´s been a horribly long time since I was able to update this. Not having the software on a modern PC doesn´t help much, but then neither does not actually doing much with the allotment thanks to distractions mentioned previously (ie a small human). I spent a good couple of years having help from my gardening lady, and thought I´d solved one problem when a neighbour said they were on the waiting list, so I asked if they´d like to keep Plot 2 while they were waiting. Of course it all went pear-shaped, they didn´t do much, Plot 2 ended up a wilderness and I got chucked off it. Admittedly I couldn´t keep up with it, but it still smarts. Well I´m back to my original plot now, I have to admit I´m relieved (I can cope with it much easier) but don´t have a shed anymore. Having said that, I started this year determined that I was not going to spend the entire season feeling guilty at not being up there, and it´s so much easier now small person is old enough to come too and help without me being afraid he´ll wander off, or needing to drag up non-gardening husband to babysit. Right, so where am I? Planting plan would be a good start. Back to basics (literally). I have got disintegrating beds everywhere (the untreated wood was only going to last 5 y and so I can´t grumble) and two beds, the ones nearest the trees, are unusable. One is now a compost heap which is going to need serious work and the other is pretty much solid grass. It is going to be a year or two before they get back into use I feel! Under the trees is a mess of weeds and raspberry canes: that too will have to be a gradual process of renovation. 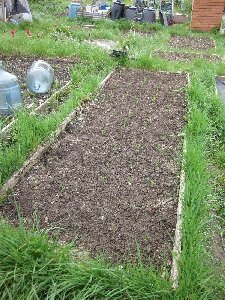 However, the eight functional beds, which have been kept under some measure of control by Gardening Lady and a bit by me, have spent the early part of 2013 under black weed control fabric after being dug over (hooray). 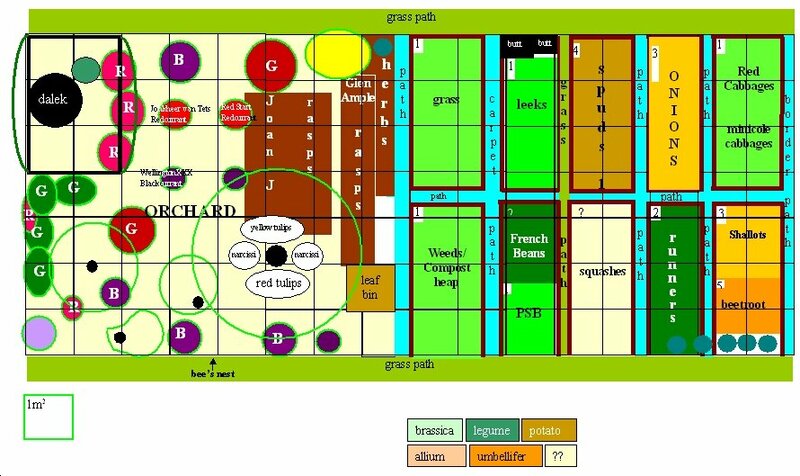 Planting plan has evolved a bit: I was originally going to have parsnips next to the French beans, but a delay in getting the bed weeded meant I missed the sowing window. Fortunately, purple sprouting broccoli came to the rescue. Pretty much everything has been started off inside, which is as well for the start of the coldest spring in many years. Potatoes and onions were bought at the Hut on February 23rd, and put immediately into modules (onions and shallots) and to chit (spuds). Leeks (my last but one pack of Verina), cabbages (rodeo red and minicole) and chillis (prairie fire) were sown indoors about the same time. I had thought to grow the cabbages in the shed but figured it was too cold there too! Eventually ended up with lots of seedlings inside the conservatory, which got moved, once they were all up, into the potting shed. That at least stopped the cabbages from getting leggy. 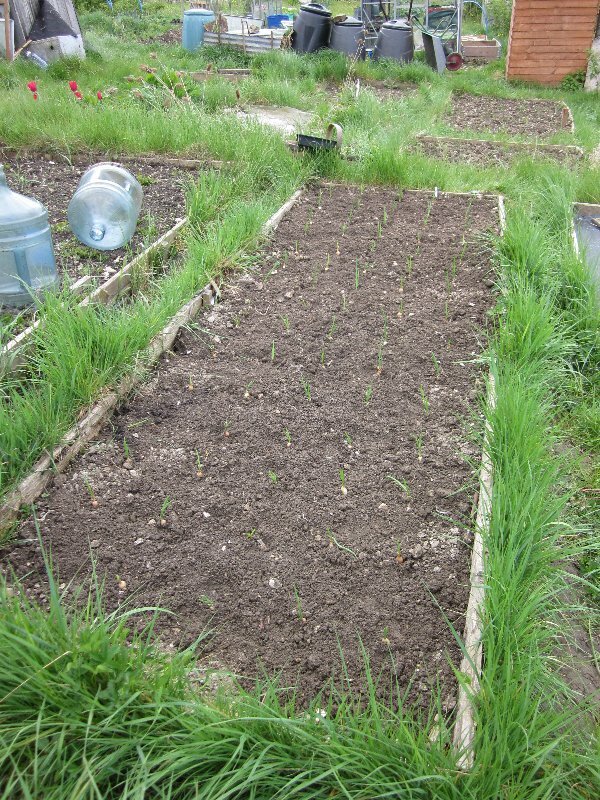 The past two years I´ve managed to grow stuff which then hadn´t then been planted out in the allotment and had gone to seed in the shed. I thought I´d try and do things early rather than late, so I had no excuse and could just get them in by the start of June. So I sowed French and runner beans, and courgettes/pumpkins in the middle of April, inside. The idea was to have everything ready by the plant sales, so all I needed to get would be anything I´d not managed to get to grow. I´m glad I did, as all the plant sales were suffering from extremely poor stocks (the cold again) and I wouldn´t have been able to get all my seedlings if I´d wanted to. March was so cold that it was impossible to get early potatoes planted. Planted eight Charlotte and eight Sarpo Mira potatoes. 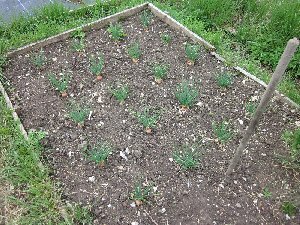 Not too many, but couldn´t really justify more than one bed until I´ve got the weedy beds back up and running. Put the shallots out at the same time: they were all in 3" pots so were doing well. Given my usual hopeless onion growing ability, I have double the usual shallots this year! 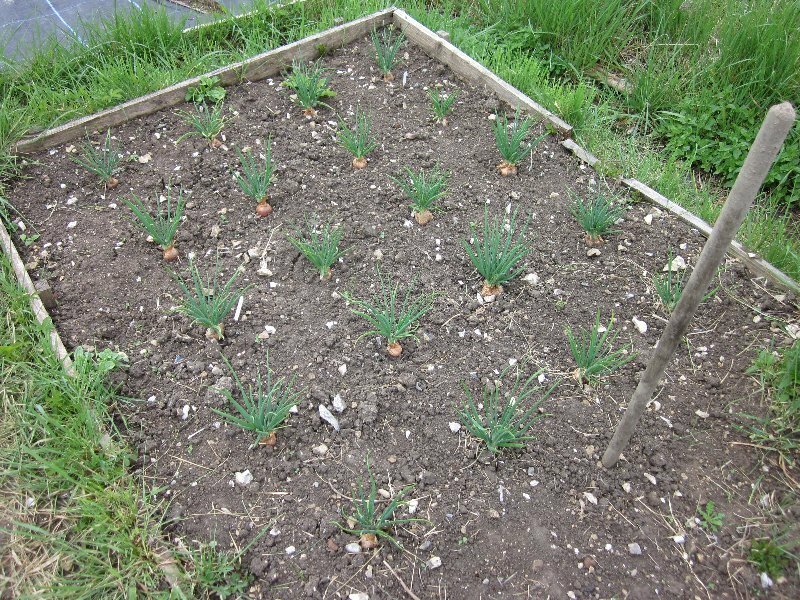 Onions out to join the shallots. The latter are doing really well. So sadly is the grass, so I can see strimming in my immediate future! 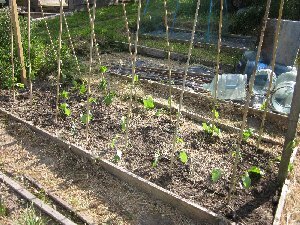 Went straight from the plot to Crownform, as I´d noticed that one of the runner bean posts had rotted and was wobbling about. That was easily solved, though I think they´ll be seeing an awful lot more of me as I start trying to renovate the beds. Up again with the new bean post, and the boys. P didn´t trust me to be able to whack it in, and he was probably right. I´d have whacked me. 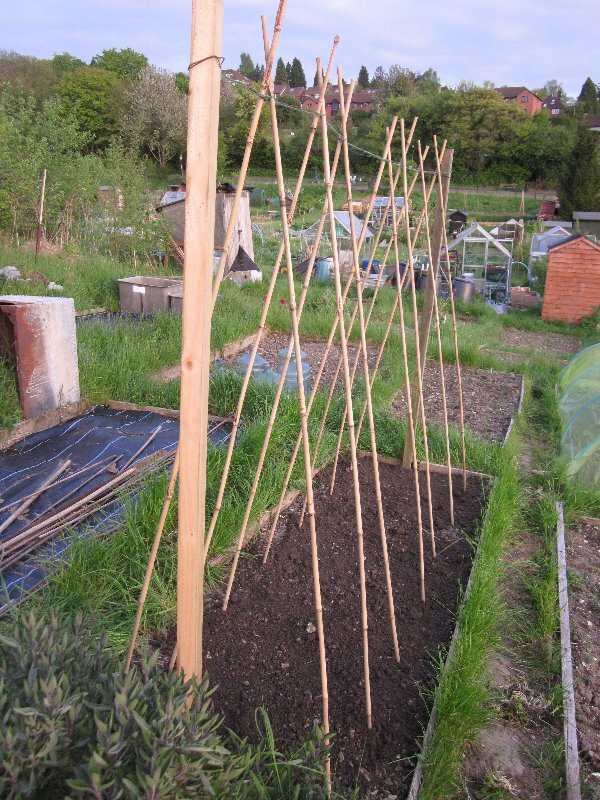 So now I have a nice new post all ready for me putting in the new canes (which I now need to buy). Today I planted out the cabbages. Having discovered that Gardman do ultra-fine mesh at half the price of Enviromesh (though a fetching green colour) I bought a pack. Smaller pack size was absolutely perfect for my size of bed. I also decided to plant through the weed fabric: not as easy as I figured, digging a planting hole through a slit! But finally they were all in. 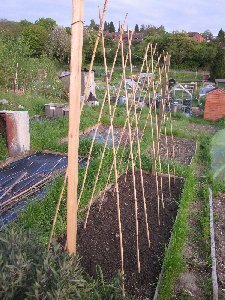 Decided to not do that for the beans though - will need to be feeding or mulching (and possibly growing a pumpkin in the middle) so the fabric was taken up before I put the nice new canes in. Of course I had a blanched crop of bindweed underneath so that got weeded. The weed control fabric is brilliant for annual weeds (take that, speedwell and the like) but the perennials just push it up. But they will weaken given the lack of light. Strimming. Much easier now I´ve actually got a proper Stihl strimmer. 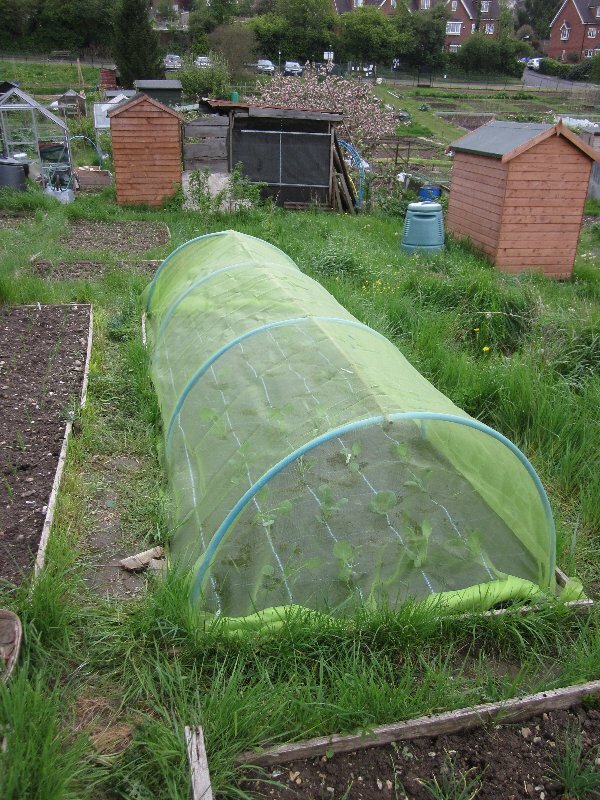 If I could pass on any piece of information to any allotment newbie, it would be that if you´re going to get a strimmer, don´t touch battery-powered ones with a bargepole, and you get what you pay for with the petrol ones. I still have the (dead) McCulloch. Nobody will service it, and though I´m sure it would be easy to get going for someone who doesn´t mind stripping a 2-stroke engine, life´s too short for someone with a full-time job and a 5 year old. Finally also met the people who have my late lamented plot 2. Told them what everything was and I truly wish them the best. Bank holiday weekend. And by some miracle, a fine one. Up to the allotment once small person was in bed, and planted out the pots of beetroot seedlings. Then embarked on the last (well, last of the main beds anyway!) bit of weeding - the topmost bed that I wanted to put parsnips in, but then decided on purple sprouting broccoli (PSB). It took over an hour to do a square yard but I think I´ve got shot of a lot of the unholy bindweed/couch/creeping cinquefoil trio that was invading. Couldn´t find the green `canes´ that I needed for the cage, so I´ll have to invest in new ones until I uncover the old ones (probably literally). Runner beans! I know I´m being a bit brave/foolhardy putting them in, but the silly things are running already despite being in the shed, so they will have to take their chances. Lovely little plants, and I hope they grow and don´t get eaten like the past two years´ sorry attempts. I´m going to direct-sow some seeds though in a week or so, in case! 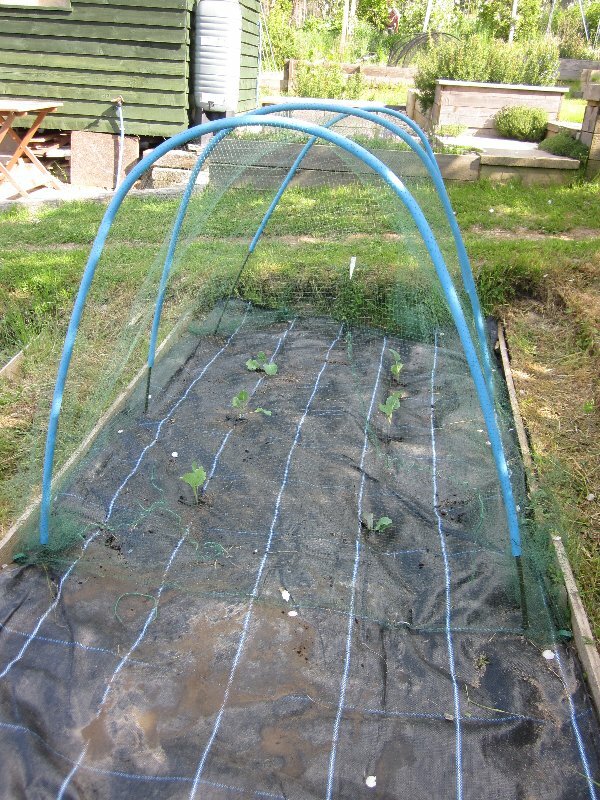 In went the PSB - like the cabbages, planted through the weed fabric. Six in, I have two spares at home still, so if any vanish, I can replace. One of the red cabbages has gone already and another is looking nibbled, so I mentioned to Vince that I looked like buying some more. He turned up five minutes later with about 10 seedlings! One got put straight in the gap, the rest went home to be potted up. Weather forecast is solid rain for tomorrow so at least everything will get a good watering..
There´s only the French beans (again growing well in the shed) and the cucurbits left (moved from conservatory to shed, so starting to harden off a bit). Amazing. 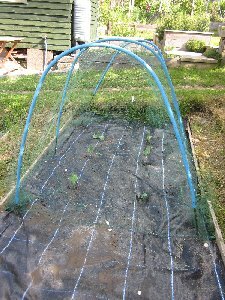 I´m definitely not putting the courgettes out until mid-June and no more frost risk.